Did You See The Memo About…Interventions? I’m starting a new series on this blog, called “Did You See The Memo?” because there are so many things I have to say in my job in urban public schools over and over and over and over and over again. And then one more time after that. And again. You get the point. Like that annoying boss in Office Space, I am that person asking if you got the memo about [insert special education referral process question] more than I would like to be. In the public schools, school psychologists are often the “gatekeepers” to special education assessments, deciding who can proceed for testing and who cannot. It is a role I hate, because all that energy could be spent on doing interventions with kids instead of fighting off inappropriate referrals. I know, I know, it’s my job, but after 10 years of saying the same thing, you start to wonder if you have turned into a psych-bot-info-kiosk. It’s one of the reasons I started this blog. You know, to mix it up. At times, I’ve fantasized about recording a conversation I have repeatedly, and then playing it back to people as needed instead of saying things again and again. Or, I could just type up the script and hand it over as a memo. That would create a lot of crying trees though, and like that fairy in Fern Gully, can’t you feel its pain? How many of you have heard or given this speech? Here’s the logic behind it. If you have a student struggling in reading, and he or she is not responding to the general education curriculum, standard teaching practices, or even extra help in the classroom, you begin to wonder why. Fair enough. I do too. Now let’s say I test this student (we’ll call her Sally), for a reading disability. Let’s say she has one. The intervention is to target her reading deficits and help her learn strategies. Let’s say Sally does not have a reading disability. The intervention is to target her reading deficits and help her learn strategies. Whoa! They’re the same. That’s right. There is no magical reading dust in special education, it is really just targeted intervention in the area of need with ongoing progress monitoring. A lot of the time, special education is basically just good teaching. So I say, why not give Sally intervention in the first place, when she first shows signs of difficulty, way before she is so far behind that we spend 6 months in a bureaucratic-laden process to call her “disabled”? If after 6 months of intervention and good data collection, you will have a lot of information to work with if you end up doing an evaluation. But logic will get you nowhere in a school district that is under-resourced or hasn’t bought into a response to intervention(RtI) framework yet. All too frequently, special education becomes the only intervention, and that is just sad. There has to be an intervention before you can make a case that you need special intervention. Also, not all students with disabilities need special education. They may just need modifications in the general classroom. That is why I am repeatedly asking what interventions have been done in general education before I will entertain the need for a special education evaluation. I need to be convinced the problem can’t be remediated with targeted intervention in general education before I suspect a disability or a need for special education. Nevermind that you could go through the whole special education testing process and find there is no disability and that whole time you could have been doing something for the student. Also, one of the “rule outs” of learning disability is that the problem isn’t due to other factors (second language acquisition issues, hearing or vision issues, poor instructional opportunities, poor attendance, etc). You can’t find out if the problem is truly neurological unless you rule out the environmental causes. The best way to do that is to provide the intervention and see if the student responds to it. 5) Sally will not flirt with boys during silent reading time. Ha! Trick question! There are no interventions in that list. There are only supports and expectations for Sally. So let’s put yourself in Sally’s shoes through an analogy. Let’s say you are in a foreign country and you are having difficulties reading in that language. Let’s say it’s Mandarin. Let’s say you get the 5 “interventions” above. Will this help your reading? Meh. Maybe? Or if you don’t know what you’re reading and you don’t have the skills, you might just sit at your special desk at home or during silent reading and just stare at the books you can’t read. And as an added bonus, your mom is checking in on you and you can’t do fun stuff like interact with others. Now let’s say the intervention is a 6 week program with a Mandarin reading tutor who teaches you vocabulary, sound-symbol correspondence, Mandarin pronunciation, and does guided reading with you to give you corrective feedback. Will this help your reading? Um, I’m pretty sure it would. The bonus is you can also do intervention PLUS supports. Just don’t leave out the intervention and then expect a school psychologist to take your referral for testing a student for a disability seriously. My eyes hurt sometimes from holding back the eye-rolling when I see only supports on pre-referral paperwork. I know the referrals come from a place of caring for the student and wanting to see progress. But let’s not be surprised when students have no intervention and do not progress. Friends, it’s not that your school psychologist doesn’t want to test the student for a disability, it’s that s/he doesn’t have any evidence that the problem can’t be remediated with a decent targeted intervention. And this is a clause that is in the law that we have to consider. It’s a two part deal: 1) Have a disability, 2) Need special education. So if the students needs can be met in general education, no matter what their processing and IQ scores are, they don’t qualify for special education. You can’t find that out if you haven’t tried targeted interventions first. Sadly, here’s the rub. At some school sites, there are no decent targeted interventions because the school can’t afford a reading specialist or intervention specialist. Not all parents can afford outside support either. And here we have the perfect example of theory and practice being at odds. I totally get why special education is so popular as an “intervention.” And I know teachers are doing their best with the resources they (don’t) have. I get that they get blamed if the student is not progressing. And parents worry that their child will slip through the cracks. I’m with you. But I fear if urban public schools don’t shift to RtI soon, I will have to bust out my memo for years to come. And nobody likes the person with the daily memo that says the same thing. Yeah…. *It can start there in the private sector. There is nothing stopping any interested parent from getting a private evaluation to undercover a student’s learning strengths and areas of need and if there is disability causing academic or social challenges. In the public schools, its a whole another ball of legal and procedural wax. So to speak. Comments on Did You See The Memo About…Interventions? And if the student gets interventions, then you have to repeatedly say, "Are you data monitoring? Where is your data?" shpiel, which, I guess, is "Germish". Now, I have to fight the temptation to just send a link the this post. I will lose this fight. 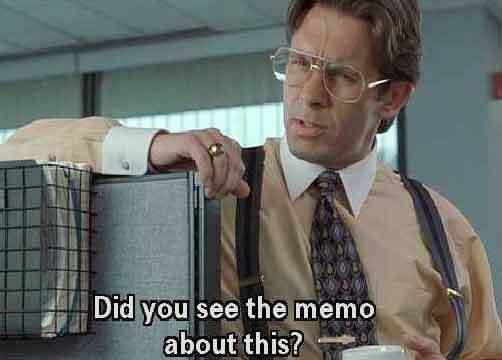 I am so with you on repeating the same "memo" over and over again. Happens to providers of the related services of OT & PT, too. Where I have worked long enough to do so – I worked to make district level procedural rules for teachers to follow, to allow screening over full evaluation and to tell everyone about the criteria for recommendation of services. Across the broad spectrum of parent and teacher abilities, well, the "memo" has to be adjusted to their level of ability (to understand) also. Parents desire to help their children is fanned and fueled by a 'rights' advocates who also promote 'fighting' with schools. This brings so many parents in demanding special education. Good post. Gave me some ideas. The problem I have encountered is not being offered any advice on how to structure interventions to best meet the needs of each student with issues. We don't have a reading specialist, so we (classroom teachers) are responsible for any intervention. Most of the time, we are offered supports by our SST instead of ideas for effective interventions. I think most teachers come to an SST wanting that kind of support, and don't necessarily want all their struggling students to be tested. I have heard of RTI, and am interested in learning more. Do you have any suggestions for professional reading? @Erika: Yes, you are a total nerd, but I share your nerdiness for good intervention materials! Do share with us if you find any good websites, books, etc. You can share on the FB Fan Page. A student is struggling is kindergarten in a middle/upper middle class town. His teacher says that he is on reading/math level, but he hates going to school…complains that it is 'too tricky'. Teacher says that he does well one-on-one, when he gets that attention, but is lost in group activities or group instruction. She does not recommend him for summer 'enrichment'. Parents see his difficulty in focusing and in listening at home. Concerned that he hates school at this age and is stressing out with compensation strategies at school. Referral went to intervention team–no action for 4-5 weeks and counting. Question: What's the legal response time for an/your intervention team? Note: School psychologist reviewed case and observed student–did not recommend testing, until parents asked him to describe the appeal process. First grade= 20 students, more difficult curriculum, one teacher…and, oh, and that quick response intervention team. first grade inclusion= 20 students, more difficult curriculum but student will have IEP–a sharable document of strengths and weaknesses developed by a team of professionals, and TWO teachers. Student tested classified with communication impairment (did I mention that neither the teacher or school psyc pushed or recommended testing). Getting Speech 2x / week; Social Skills 1X / week; both teachers know how he learns and what he needs, developing interventions and tracking them in the class. The intervention team would not/could not provide this type of service. There are too many horror stories about kids who get alienated from school or lose their academic confidence because they missed out on services early. Intervention teams can work for some students, but they are not as influential or authoritative as an IEP. Bio: I've worked in schools for close to 20 years–10 years as a teacher in an urban public high school, and I've dealt with classified and nonclassifed students as a teacher and a parent. The one thing is true…parents who advocate get the best results for their kids. This is an open secret among teachers and administrators. I know this is a space for school psyc people–parents and teachers have their spaces, but I needed to share my perspective here. I believe your perspective would change if you had a son or daughter who you suspected of having a learning disability. Mine certainly did. Thanks for your story. It is true that the flip side of the over-referrals is the under-referrals of kids who really need it. If it's any consolation, I would have tested that kid as a part of that intervention team. I think the school psych has to be skilled enough to make these decisions based on when the kid has a suspected disability. What you described would have made me wonder about ADHD and/or an auditory processing deficit. With the info you presented, the "hold up" might have been the issue of him/her "being on grade level." This is so hard because the law dictates that the student must be below grade level to qualify as LD (unless you are in a district that embraces RtI) and it is very hard to be below grade level in Kinder. I share the frustration with parents and teachers that we sometimes wait for the student to "fail enough" to be eligible as LD. It's not research based, and it's not best practice, but sometimes school psych's hands are tied with the federal law. Parents and teachers (and school psychologists for that matter) should advocate for assessment in the cases you have described. I work with middle school kids and I often wonder why they weren't tested before they hated school so much. If RtI were in place and effective, they would have gotten years of effective intervention. It is unfortunate that special education is the only game in town in many districts for a high quality intervention. Then, you see a really horrible pattern of only affluent parents getting special education for their kids because they bring in lawyers and advocates and outside reports, and the parents with less resources have under-identified kids. It is a huge systemic problem. School psychs know it, teachers and parents know it, and sadly, the movement to RtI is glacially slow in many under-resourced districts. Yes but..In my district the process is designed to stall the referral for an evaluation as long as possible. The principals even have a manual explaining how to do it. The only way to get around it is for the parent to walk in and demand to sign the request for an eval, NOW. However, teachers are in big trouble if they tell the parents that so many kids go months and even an entire school year without help. @Jwg: Don't I know it. *Sigh* School psychs are put in a terrible position of having to enforce stupid policies and laws that haven't caught up with the research. Hello? EARLY intervention? Anyone? I think that most of us are sadly, seen as gatekeepers to special education, when in fact, we all want to be Keymasters (Keymistresses?) to high quality interventions. If that intervention is special education or within general education, no matter, as long as it's high quality and appropriate for the kid. I try to think of every kid as someone's precious baby, and that helps me guide my decisions about testing. That way, I'm not a psych-bot following the manual/procedure just because its there. Sure, sometimes that precious baby is 13 years old and drinking Hennesey at school, but he is still someone's baby. Thank you, thank you, thank you for this post! I know I'm a little late to the party, but a colleague of mine sent me a link to your blog and I found this in your "Best of 2010" recap. As a fellow school psych, I feel your pain and like you I think of all of my kiddos as someone's child. What many (parents/teachers alike) do not understand is what you put here – we need to follow the law under IDEA as well as our state's own laws/guidelines. In my state, RtI has to be in place for 9 weeks (45 instructional days) before we can even look at an evaluation. Yes, parents can come in and demand an eval prior to RtI but I would be forced to evaluate that student and then not qualify them since we have no evidence of attempts at RtI or any progress monitoring – which is now required, by law. My large, urban school district (with 85% of students in free/reduced lunch) is in its 5th year of RtI implementation and we STILL continue to have to rehash your "memo." This is supposed to be a regular ed initiative – NOT a simple gateway to spec ed. Research based interventions (not simply supports) must not only be in place, but implemented as intended AND with valid progress-monitoring as well. DIBELS by itself is NOT an intervention – it is a progress monitoring tool! If you have a student read passages from DIBELS ORF over and over again for 45 days with no other intervention in place, do you really expect a significant jump in their fluency or comprehension? Also, preferential seating is NOT an intervention either….agh! I, too, hate being the gatekeeper and proverbial "bad guy" but without administrative support and 100% teacher buy-in, RtI makes me feel like Sisyphus at times. This post actually has made me a little glad I am taking a (hopefully) short break from work in the schools to work in a hospital setting. And you didn't even dive into the high turnover rate in the schools, which increases the need for (re)education about the referral and intervention processes even more. Some of the commenters may not have seen school psychologists advocate for students and/or parents, but the vast majority of us have done that when we need to and are able to. Many of us have also pushed for regular education interventions because they may be a better fit than special ed, particularly when they take place in the classroom of a phenomenal teacher. For those districts that do progress monitoring, it is fun to collect the data before and after a student qualifies for spec ed to see if they can spot when spec ed started. It's typically where scores stagnate or decline.